Iconic actor Ian McKellen discusses his departure from the 'X-Men' and 'Hobbit' film franchises, the upcoming 'Beauty & The Beast' movie, and a potential Oscar nom for last summer's 'Mr. Holmes.' Plus, Ian weighs in on LGBT issues & comments on the Syrian refugee situation. "Whenever I was going out to middle earth to do the Lord of The Rings, from London, I would stop in LA and stay with him and his partner. We have stayed friends and hope to find another film. I asked if I could be in Beauty and the Beast because Bill is doing the remake with live action. I get to play Cogsworth, the clock. Not an extensive role, but a fun role." 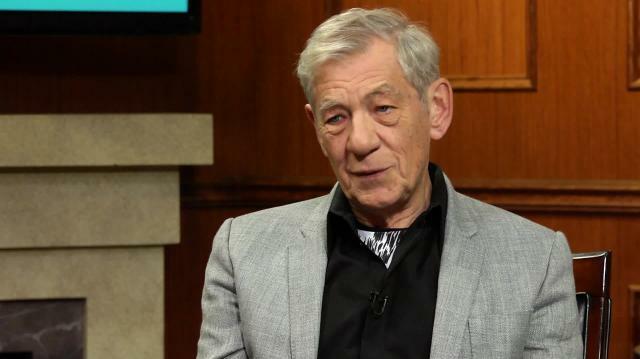 - Ian McKellen on Bill Condon, their friendship, and Beauty and the Beast role. "I had an audition with Woody Allen once to be in a movie; I was so excited because it is every actor's dream to do at least one Woody Allen. He sat behind a screen; he was rather nervous, I met the cast. What was astonishing about the script was every 'um' and 'errrr' was written into the script, so that it sounded as if you were making it up as you go along, but all the hesitations were actually written in the script. I didn't get the part. I said, 'so you write this out exactly as you want this to be spoken?' He said, 'Yes, I am a scriptwriter. Not a director, I'm a scriptwriter.'" - Ian McKellen on being rejected for a Woody Allen role. "I was asked to be in a film with Gary Oldman called 'Prick Up Your Ears.' That was about an English playwright named Joe Orton, who was murdered by his boyfriend and I was to be cast as the boyfriend. I needed a holiday, I had been working so hard, so I just kept saying, 'no, no, no,' and when I saw the film I really regretted it."